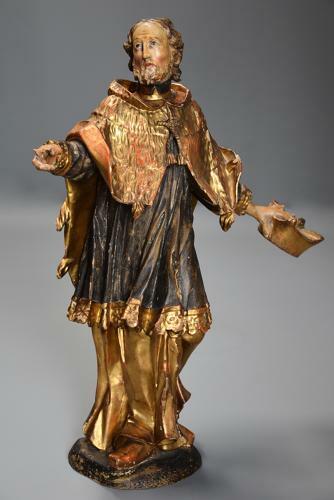 This carved figure depicts St Peter standing in his gold and blue robes with textured gold cloak holding a hat, possibly his Bishops hat. St Peter was always listed as the first of the Twelve Apostles in the gospels, later he was said to have co-founded the Church in Rome and became Bishop of Rome. This carving is in very good original condition (the index finger on his right hand missing), is of stable construction and can go straight into a home or collection.